Today is a busy day. First an announcement for my new release Bonds of Friendship, and now a Cover Reveal. It is only getting better and better with this series. The Assassin’s Prophecy and Nightmare of Ferrês will open your eyes to the world of Tarzinëa and the direction the series will go with the target audience. Below you will find the cover for Nightmare of Ferrês the 5th installment within the Tales of Ferrês series. You will get to see the true horror that lives within the shadow of Ferrês, the land the kyres and twin-tailed foxes fear treading. Keep your eyes peeled for Pre-Order announcement. Hope you enjoy this awesome cover reveal. To get notified about official release dates follow K.M. Jenkins on her website, subscribe to her mailing list, join her street team, or like her on Twitter/Facebook. These stories don’t follow a timeline and each can be considered a stand-a-lone. They don’t have to be read in any particular order, so feel free to have fun with it. If you are wanting sneak peeks beside what my flash fiction tales and short stories provide, please consider joining my street team. It is a group of fans, fellow authors and friends that come together to learn about the worlds I create, promote my books and help me along my journey as an author. K.M. 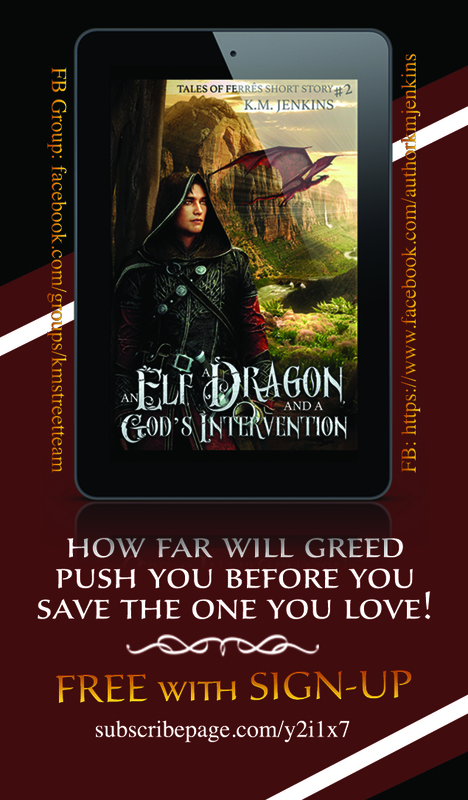 Jenkins (a.k.a Katie), is a speculative fiction author that creates world of Epic Fantasy and Paranormal Romance. She released her first short story, “​A Father’s Protection” in August of 2018, and plans to publish several more short stories before the year is out. When K.M isn’t writing, she runs her business as a cover artist at ​KJ Magical Designs, LLC and chases her twin boys around the house. Between the three she has epic battles throughout the day and nothing ever gets boring.